The film centres on con-artist Keisha Ceylon (Emily Hampshire), a mother trying to etch out a ‘decent’ living for herself and her young son. She offers psychic services for a prominent fee in missing person cases. When she reads in the news of a missing person, she shows up. 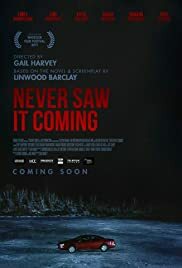 NEVER SAW IT COMING focuses on one of her cases gone foul. One trouble with the film is that the audience is treated like idiots having to have all the plot points explained to them. This is evident from the film’s first scam that the found missing son is in cohorts with Keisha in fooling his parents to pay her so that they can split the cash. Eric Roberts (star of the 70’s and 80’s and brother of Julia Roberts) gets star billing for a minor part. He plays Wendell Garfield who is in the film’s most problematic scene. This is the one in which he is approached by Keisha after his wife’s death, she proposing to help him with her disappearance using her psychic powers. He is initially shown as a strong skeptic only to become a believer in a few minutes. She uses the word child and then he uses the word baby and she re-uses the term baby for child so that he starts believing her. All the dialogue is too obvious for a psychic to use and the segment is totally unbelievable less silly. Without much warning, a plot wist (not to be revealed in this review) occurs which stretches more of the story’s credibility. The script or source material contains a few plot holes. The most glaring one is the detective revealing all the case details to Keisha. In real life, these things are kept from the public, especially when the investigation is not yet complete. The film is advertised s a comic thriller though there are hardly any laughs. As a thriller, the violent acts occur suddenly, without warning so that there is little suspense or thrills either. The film contains more violence than necessary and director Harvey is not shy to show to blood and gore. To Harvey’s credit, he shoots a few solid scene like the ones at the start with the car breaking into the ice and then slowly sinking into the frozen lake. The film picks up whenever the story focuses on Keisha’s family life. The abusive relationship with her boyfriend is the more interesting topic. They represent the typical quarrelling couple that can no longer get along for the main fact that they have lived with each other for too long and are not willing to give love a second chance or sacrifice their own interests for the other. The boyfriend is a loud-mouthed idiot who is interesting to watch. What she sees in him initially is a complete mystery. But Keisha still manages to get him to do some of her dirty work. NEVER SAW IT COMING makes good material as pulp fiction material. As a film, it gets bogged down with implausible scenes and sub-par dialogue. One can only shrug whenever a new plot twist occurs.